Μια συνέντευξη (στα Αγγλικά) με τον ΜΠΑΡΜΠΑ ΝΙΚΟ ΤΕΜIZH o οποίος κατοικούσε στο Μέγα Ρεύμα , στο ΚΙRΕÇHANE sokak no 10 . Τώρα και εφόσον είναι στη ζωή βρίσκεται όπως και πολλοί άλλοι γέροντες στο Γηρ. Βαλουκλί. Mr. Niko, can we know some things about you such as where you are from and where were you born? In Arnavutköy. I'm Niko Temizis from Arnavutköy. Do you remember which year it was? 1320 (1902). The new calendar system came later. Okay Kir Niko. How many siblings did you have? Where did you play the laterna? Everywhere. In Arnavutköy, Küçüksu, Çengelköy. They picked me up and brought me to Ankara by plane. I was everywhere. I played at a panayir for one month... I slept and woke up there. Okay, where was the last place that you played? The last place was at the saray Club in Kuruçeşme. In the middle of the sea. I last played there. Then I quit. Can you remember what the date was? It was a long time ago. Okay, who attached the pins? Who inscribed the songs onto the cylinder? There were other masters who did the pins. There was Polikarpos. There was Stamati. Where were their work places? Some lived in Ortaköy. 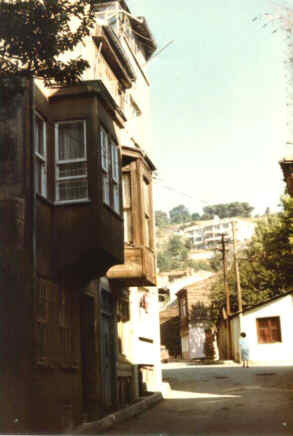 Some lived in Beyoğlu. Some in saray. Then there was Yorgos in Yedikule. He had a laterna. There was Dikran. Then there was an Armenian by the name of Çakır from Ankara. Keram Çakır. He lived in Kasımpaşa. Yes, they did. At that time there were a lot of masters. Also by the police station as you go down to Dolapdere (Kalyoncu Kulluk Sokağı). There was a laterna maker by the name of Pandelis near the Aya Kostantin and Helene church. He did the pins. Another one was Dimitro of Dolapdere... I knew many of them. They invited me to play everywhere. There was master in Yeniköy. Yes. Father and son were carpenters. But I can't remember their names. Okay. What about Yorgos Rondis? He was my friend. I worked together with Yorgos Rondis. He died here. It was a long time ago. Rondis was a very good man. He distributed food to the poor in Kurtuluş. What tunes did your laterna play? It had both Turkish and Greek songs. It had Konyalı, Adanalı, Üskudar'da bir yağmur vardı. [Üskudara gider iken...Katibim] When the tunes got old we put in new ones. We had money. When a new song came out we'd go and listen to it before anyone else and before anyone else bought it we'd buy it. We called the laterna "organo", that is, çalgı (instrument). Did you pay a lot of money for new songs? Eh! But at that time we earned a lot of money. As soon as Turconi made a new song we went right away and got it. Just like for the gramophone; we'd change the cylinder just like putting on a new record. Was there someone who played def? I played and danced at the same time. When I got tired I'd switch arms. I'd turn (the laterna) and my friend played def. Okay, did you go and play in movies? Did they ever film you? Of course we did a lot of movies. They filmed me. Where? So, when you were playing did they film you or did they only do a sound recording? They filmed us while we were playing. We played in a lot of movies. Did you only give them music, or did you go to the studio and play for them? I can't remember. We played in movies. Okay, let's talk about Turconi. Did you know Turconi? Of course. He was actually Italian. They call the real laternas Turconi. Turconi is the one who taught us this profession. There was a Greek consulate right beside him. He had a large apartment for himself. This means that he moved there afterwards. Okay, did Turconi have a shop in the Perşembe Pazar area? It was in Karaköy. Do you know about this? No, I don't remember this. I remember the large apartment by the Greek consulate. Okay, were laternas made in Istanbul? Or did they only attach the pins? Of course, of course. Turconi did this. Of course, of course. You mean, only the pins were attached? That was a different usta (master). Turconi brought in wood from Romania for reinforcement. He needed this. He brought wood by boat. I say this now as we heard this from other ustas. His actual business was the laterna. Turconi made them. He was a teacher. He played the songs with his mandolin and then transferred the song to the cylinder. Okay, did Turconi sell pianos? Of course, he sold pianos. Did you ever play laterna at the panayirs in Tatavla? How many laternas were at the Tatavla panayirs? Many. At that time it was cheap. Are there any photographs left over from the panayir? At that time we didn't think this stuff was very important. No. Okay, how did you dance? Other than the def that you were holding what else did you hold? For instance, [did you hold] tesbih (prayer beads)? I had a tesbih. An amber tesbih. We carried the laterna, played it and danced about. Who played the laterna the best? Who ever was interested in it could play. The tempo had to move along well. That's what it took. How did the laterna affect people when it was played? The laterna was a very sweet instrument but the time for us has passed. It became out-moded. One group of laternas went to Athens and very few were left here. Now the laternas aren't worth much...Now there are cassette recordings. There are cassette players. The laterna isn't worth much anymore. A laterna cassette is about to come out. Is this a good thing? Is it possible to say that the laterna was hard to play? Is it easy to change songs? How many songs were there? There were nine. The pins attached to the cylinder were essential. There were high pitched pins. The low pitched pins were separate. Okay, what kind of feelings did the laterna create in people? Now the laterna, there was kanun then the instrument played...it [the laterna] worked okay alongside [the kanun]. If it was another kind of music, it didn't work alongside the laterna. Whatever the customer wanted we put it on [played]. [When they said,] "Put on a kasap tune...", we put on a kasap tune. That wasn't what I wanted to ask. I meant, what did you think about when you played the laterna. What did you feel? Yes, [in Greek...] My Turkish isn't very good. You translate for me. Music is food for the soul. Did you ever play kanun? Nooo, I didn't play it. Okay, did you earn money from this profession? Eeee, of course we earned money from it. This work didn't go for free. Were you able to support yourself on this work? Did you know other Greek musicians? Yorgos Bacanos... We worked together on Buyukada Island. There was also Andreas who played accordion in Kurtuluş. Is it possible that you are the person playing laterna on the cassette that we played for you? It's possible. I can't remember. We appeared in a lot of movies, in magazines... But he plays well. This must have been a cylinder made by Turconi [in the laterna playing in the film]. Do your days pass well here?